On Saturday, April 29, 2017, the Disney Wonder became the first passenger ship to transit the recently expanded Panama Canal locks when she entered the Aqua Clara Locks from the Atlantic near Colon, Panama. The following is video of the first left to the transit through the Aqua Clara Locks from video released by DCL. The $5.4 billion expansion of the Panama Canal which started in the fall of 2007 officially opened to traffic on June 26, 2017 with the new Panamax container ship, Cosco Shipping Panama becoming the first ship to make the transit. The new set of locks feature sliding gates, doubled for safety. Each chamber measures 1,400 ft long, 180 ft wide, and 60 ft deep allowing vessels with a beam of up to 160 ft, an overall length of up to 1,200 ft and a draft of up to 49 ft. 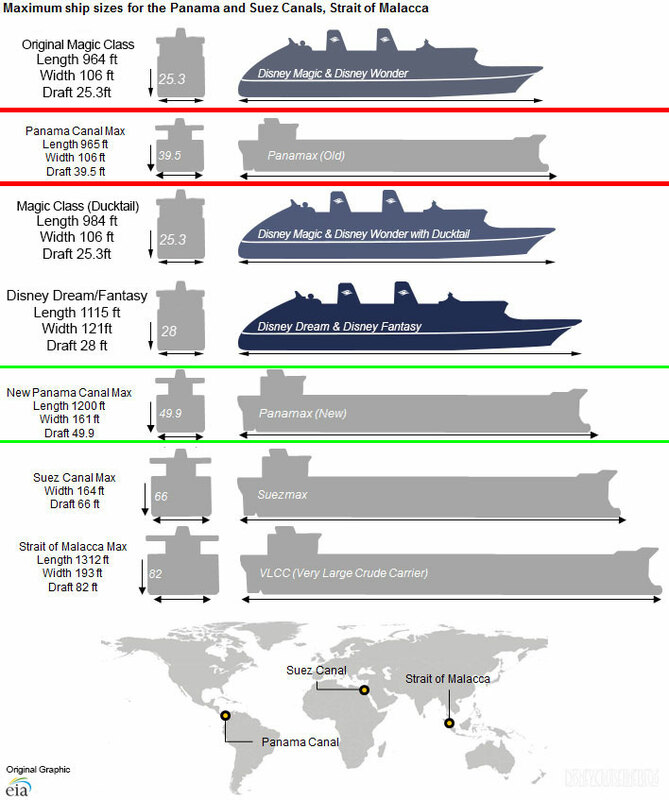 The following graphic provides a look at how the Disney Cruise ships compare to the maximum ship sizes from the Panama and Suez Canals as well as the Strait of Malacca. Please note the difference between the original Magic class and the current length of the Disney Magic and Disney Wonder with the addition of the ducktails during the 2013 and 2016 dry docks. For more coverage on the Disney Wonder’s historic transit, please visit our Saturday morning Panama Canal coverage. This entry was posted in Video and tagged Disney Wonder, Panama Canal by Scott Sanders. Bookmark the permalink. Scott, I think you mean June 26, 2016 instead of June 26, 2017. Andrew, that is correct. Dream class ship would fit in the new Panama Canal locks. The part has been a topic of discussion is the Bridge of Americas. According to the technical data sheet for the Disney Dream, she is listed at 217 feet with a 28.2′ draft. This leaves an air draft (ship above the waterline) approximately 188′. The Bridge of Americas clearance below at high tide is 201′. Based on these numbers I do not see what would prevent the Dream class ship from transiting the Panama Canal. So with the new allowances it means the Fantasy and the Dream can now go through the Panama Canal? Interesting! We’re on board the Wonder right now, it was an amazing transit, very smooth and swift locking, lots of people on the Panama City side to welcome us through including Karl Holtz who came on board to exchange key’s and plaques with Panamanian officials welcoming the Wonder as the first Cruise liner to transit the new locks! I heard not so good things about this cruise itself and it’s poor customer service, food options and quality, a large disappointment by this Disney crew on this April.to May 2017 cruise, making us look at other cruise lines. Interesting…Everyone is of course entitled to their thoughts and opinions but having just gotten off yesterday in San Diego, I would say that they stepped up their game. We had no issues at all, food was better than previous DCL cruises where I did leave unimpressed. We did see some issues (that did not affect us) that definitely could have put a damper on things if what we thought may have happened did occur. (no way to verify myself) Sincerest wishes in wherever your search may lead you! We had the best food of any of our eight cruises. The ship was beautiful and we had great service. Would do it again! We just got off this ship yesterday also. It was our first Disney cruise, and we were VERY impressed with this cruise. Everybody treated us great, no issues what so ever. Food was great, we loved our servers Raka and Felix at table 6!! Danish kept our room in perfect condition! Can’t wait to cruise with Disney again. We are totally hooked!!! !